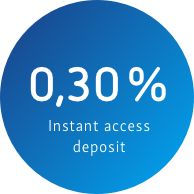 Our instant access deposit account gives you maximum freedom. We offer you flexible and save saving without any minimum deposit requirements. Experience having complete control over your investments with our online banking portal, irrespective of where you happen to find yourself in the world.